It would take about an hour to download a 1 megabyte file with this contraption. We thought we were on the cutting edge of technology. 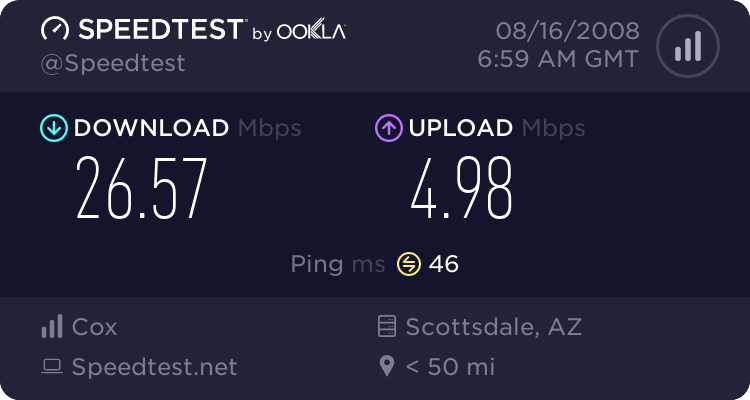 This evening, just for fun, I did a speed test on my internet connection. Details are below, but for those of you who are not tech geeks, I’ll translate. With that connection speed, I’m downloading at about 2.5 megabytes per minute. That’s a far cry from the “old” days of 1 megabyte per hour, and that’s really cool. Can’t wait to see what I’m writing about in ten years, or where I’ll be writing it. That is amazing! I wish they would hurry up and upgrade my neighborhoods network.